It becomes a recursive problem, best solved through differential calculus (but more often just approximated). Suffice it to say that, as Tom pointed out, you really won't realize that whole 16% speed increase. And you need to factor in the increased weight. Apparently this is why slick composite aircraft are so Fast! Imagine the 915is in an Arion Lightning??? Let's see... velocity varies with the square root of power, and parasitic drag goes up with the square root of speed. So, parasitic drag varies with the fourth root of power? That means running a 912iS flat out will increase parasitic drag 7%, I think. All this is covered quite thoroughly in Chapter 2 of "Aerodynamics For Naval Aviators", available online. Though the math quickly gives me problems. We weren't allowed to read that book in the Air Force. drseti wrote: We weren't allowed to read that book in the Air Force. Well, you DO know what carrier pilots say, right? Interesting thought just hit me and this assumes that the new 915is is like all other 9 series engines so is designed to run at near max power all-day long. This means that 135hp is the normal cruise setting which would compare to the 75% cruise we all were taught for Lycoming and Continental. The Cessna 172 and Piper Archer are powered by 180hp engines which equates to 135hp for cruise (0.75 * 180) so they are essentially the same in cruise. You'd lose a bit in climb at the lower elevations but the 100+lb savings in weight would offset this a bit. The IO360 weighs over 300lbs with the 915is being under 200lbs. I could certainly see the experimental world embracing the 915. Tecnam offers the 914 in the LSA line -- wonder if we could see the certified P2010 sport a new engine option in a couple years? FD's C4 comes to mind as well. One relevant fact that I discovered is that U.S. market Remos GX with the 912ULS engine and Neuform propeller tops out lower than I expected. It's unbelievably, blazingly fast at 1500 MSL over Arkansas - easily cruises 120 knots true. Come to New Mexico, and it slows to 109 knots at 6500 MSL. The only other point of reference that I verified like that is Piper Arrow with a 200 hp fuel-injected Lycoming and a constant-speed propeller. Its best cruising speed is actually at 6000 ft and it slows down a bit as you climb over 8000, and then starts dropping off a lot up into the oxygen boundary.. Interestingly enough, a Cessna 150 also slows down at sea level and cruises the fastest around the same 5000 ft or so. I haven't tested it rigorously though, but I see the reason of strange cruise speeds of LSAs laying with Rotax 912 ULS and its carburators rathern than with U.S. market LSAs having fixed-pitch propellers. If that is true, than it suggests enormous benefits from modest turbocharging in my typical environment. I hardly ever have an opportunity to descend below 5000 ft.
By the way, the main parket for 915iS is going to be the gyros. You can never have too much hoursepower in a gyro. The only happy gyro driver around my parts who actually flies it anywhere has a 230 hp engine (based on Subaru 2.5L block and a little 8 psi turbo). Everyone else struggles so much that it's no fun anymore. 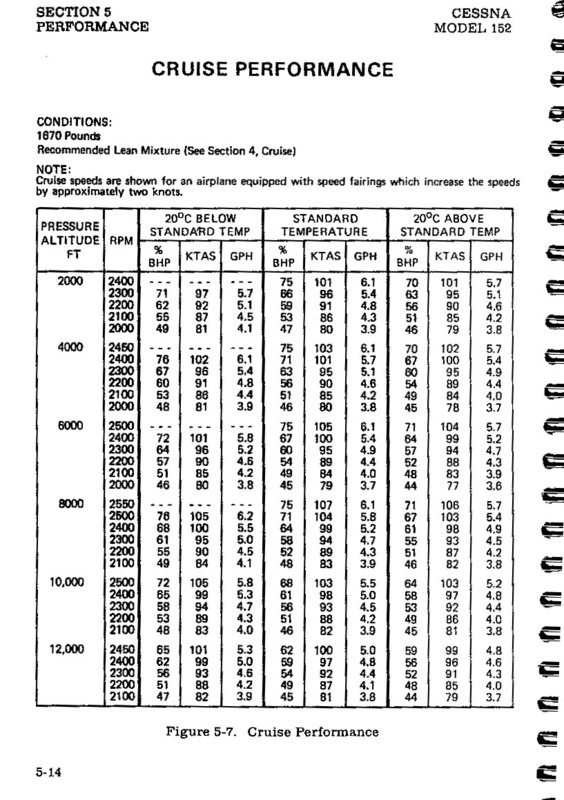 zaitcev wrote: Interestingly enough, a Cessna 150 also slows down at sea level and cruises the fastest around the same 5000 ft or so. While it is true that at any given power setting, TAS will go up with altitude, 100% power is only available at sea level (normally aspirated) so that's where maximum speed should always occur. If in doubt, I can dig up performance charts to post. That only appears to top out at 8,000' because of the limitation to 75% power. If that's what you mean, that's true of all normally aspirated engines. Top speed will still be found at SL, however. FastEddieB wrote: That only appears to top out at 8,000' because of the limitation to 75% power. If that's what you mean, that's true of all normally aspirated engines. Top speed will still be found at SL, however. You're right about that. I'm looking at the similar chart for Arrow right now and I see that 2700 RPM line continues to advance all the way to the sea level. It's just that a limit exists for the manifold pressure at 2400 RPM, and the 75% speed line increases with altitude until it intesects the full-throttle line. I completely forgot about that. It's hard for me to see how this heavier and also more expensive engine has any role in Light Sport Aviation. But Pete's on the right track when pointing out how great it would be for some aircraft in higher DA settings. zaitcev wrote: You're right about that. I can't tell you how refreshing that is. The way everyone seems to be so polarized and hair-triggered, I was all primed for an argument! Thanks for a breath of fresh air. If you want to fly as fast as possible, it will be at SL at full throttle. If you want to fly at 75% power, 7,500' is the sweet spot, conditions permitting. Speed falls off above that, since 75% power will no longer be available. If you want to fly at 65% power, the sweet spot moves up to just over 10,000'. If you want to fly at 55% power, the sweet spot moves further up to about 12,000'. I think these figures will hold roughly true for any normally aspirated engine. Charts will tell the same story, but graphs are more graphic (duh).